"Geothermal" redirects here. For other uses, see Geothermal (disambiguation). 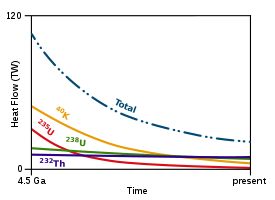 Temperature profile of the inner Earth, schematic view (estimated). Geothermal gradient is the rate of increasing temperature with respect to increasing depth in the Earth's interior. Away from tectonic plate boundaries, it is about 25–30 °C/km (72-87 °F/mi) of depth near the surface in most of the world. Strictly speaking, geo-thermal necessarily refers to the Earth but the concept may be applied to other planets. The Earth's internal heat comes from a combination of residual heat from planetary accretion, heat produced through radioactive decay, latent heat from core crystallization, and possibly heat from other sources. The major heat-producing isotopes in the Earth are potassium-40, uranium-238, uranium-235, and thorium-232. At the center of the planet, the temperature may be up to 7,000 K and the pressure could reach 360 GPa (3.6 million atm). Because much of the heat is provided by radioactive decay, scientists believe that early in Earth history, before isotopes with short half-lives had been depleted, Earth's heat production would have been much higher. Heat production was twice that of present-day at approximately 3 billion years ago, resulting in larger temperature gradients within the Earth, larger rates of mantle convection and plate tectonics, allowing the production of igneous rocks such as komatiites that are no longer formed. Temperature within the Earth increases with depth. Highly viscous or partially molten rock at temperatures between 650 to 1,200 °C (1,200 to 2,200 °F) are found at the margins of tectonic plates, increasing the geothermal gradient in the vicinity, but only the outer core is postulated to exist in a molten or fluid state, and the temperature at the Earth's inner core/outer core boundary, around 3,500 kilometres (2,200 mi) deep, is estimated to be 5650 ± 600 Kelvin. The heat content of the Earth is 1031 joules. Much of the heat is created by decay of naturally radioactive elements. An estimated 45 to 90 percent of the heat escaping from the Earth originates from radioactive decay of elements mainly located in the mantle. Gravitational potential energy released during the accretion of the Earth. Heat released during differentiation, as abundant heavy metals (iron, nickel, copper) descended to the Earth's core. Latent heat released as the liquid outer core crystallizes at the inner core boundary. Heat may be generated by tidal forces on the Earth as it rotates. The resulting earth tides dissipate energy in Earth's interior as heat. There is no reputable science to suggest that any significant heat may be created by the Earth's magnetic field, as suggested by some contemporary folk theories. The radiogenic heat from the decay of 238U and 232Th are now the major contributors to the earth's internal heat budget. In Earth's continental crust, the decay of natural radioactive isotopes makes a significant contribution to geothermal heat production. The continental crust is abundant in lower density minerals but also contains significant concentrations of heavier lithophilic minerals such as uranium. Because of this, it holds the most concentrated global reservoir of radioactive elements found in the Earth. Especially in layers closer to Earth's surface, naturally occurring isotopes are enriched in the granite and basaltic rocks. These high levels of radioactive elements are largely excluded from the Earth's mantle due to their inability to substitute in mantle minerals and consequent enrichment in melts during mantle melting processes. The mantle is mostly made up of high density minerals with higher concentrations of elements that have relatively small atomic radii such as magnesium (Mg), titanium (Ti), and calcium (Ca). The geothermal gradient is steeper in the lithosphere than in the mantle because the mantle transports heat primarily by convection, leading to a geothermal gradient that is determined by the mantle adiabat, rather than by the conductive heat transfer processes that predominate in the lithosphere, which acts as a thermal boundary layer of the convecting mantle. Heat flows constantly from its sources within the Earth to the surface. Total heat loss from the Earth is estimated at 44.2 TW (4.42 × 1013 Watts). Mean heat flow is 65 mW/m2 over continental crust and 101 mW/m2 over oceanic crust. This is 0.087 watt/square meter on average (0.03 percent of solar power absorbed by the Earth ), but is much more concentrated in areas where the lithosphere is thin, such as along mid-ocean ridges (where new oceanic lithosphere is created) and near mantle plumes. The Earth's crust effectively acts as a thick insulating blanket which must be pierced by fluid conduits (of magma, water or other) in order to release the heat underneath. More of the heat in the Earth is lost through plate tectonics, by mantle upwelling associated with mid-ocean ridges. 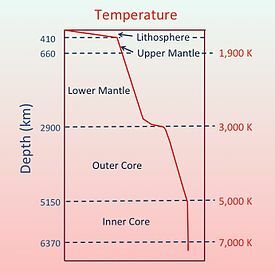 The final major mode of heat loss is by conduction through the lithosphere, the majority of which occurs in the oceans due to the crust there being much thinner and younger than under the continents. The heat of the Earth is replenished by radioactive decay at a rate of 30 TW. The global geothermal flow rates are more than twice the rate of human energy consumption from all primary sources. Heat from Earth's interior can be used as an energy source, known as geothermal energy. The geothermal gradient has been used for space heating and bathing since ancient Roman times, and more recently for generating electricity. As the human population continues to grow, so does energy use and the correlating environmental impacts that are consistent with global primary sources of energy. This has caused a growing interest in finding sources of energy that are renewable and have reduced greenhouse gas emissions. In areas of high geothermal energy density, current technology allows for the generation of electrical power because of the corresponding high temperatures. Generating electrical power from geothermal resources requires no fuel while providing true baseload energy at a reliability rate that constantly exceeds 90%. In order to extract geothermal energy, it is necessary to efficiently transfer heat from a geothermal reservoir to a power plant, where electrical energy is converted from heat by passing steam through a turbine connected to a generator. On a worldwide scale, the heat stored in Earth's interior provides an energy that is still seen as an exotic source. About 10 GW of geothermal electric capacity is installed around the world as of 2007, generating 0.3% of global electricity demand. An additional 28 GW of direct geothermal heating capacity is installed for district heating, space heating, spas, industrial processes, desalination and agricultural applications. The geothermal gradient varies with location and is typically measured by determining the bottom open-hole temperature after borehole drilling. To achieve accuracy the drilling fluid needs time to reach the ambient temperature. This is not always achievable for practical reasons. In stable tectonic areas in the tropics a temperature-depth plot will converge to the annual average surface temperature. However, in areas where deep permafrost developed during the Pleistocene a low temperature anomaly can be observed that persists down to several hundred metres. The Suwałki cold anomaly in Poland has led to the recognition that similar thermal disturbances related to Pleistocene-Holocene climatic changes are recorded in boreholes throughout Poland, as well as in Alaska, northern Canada, and Siberia. In areas of Holocene uplift and erosion (Fig. 1) the shallow gradient will be high until it reaches an inflection point where it reaches the stabilized heat-flow regime. If the gradient of the stabilized regime is projected above the inflection point to its intersect with present-day annual average temperature, the height of this intersect above present-day surface level gives a measure of the extent of Holocene uplift and erosion. In areas of Holocene subsidence and deposition (Fig. 2) the initial gradient will be lower than the average until it reaches an inflection point where it joins the stabilized heat-flow regime. A long time before anything was known about the floors of the oceans a certain notable from the University of Sydney had been reporting a thermal gradient of about 30 °C per vertical mile in the mines (ca 0.01864 Kelvin per meter) and an estimate of the underworld combining such a gradient with the Stephens measurement on Basalt would find a rate of about (1.7 ⋅ 0.01864) 0.03 watts per square meter instead of the 0.06 W ⋅ m-2 like the one found in a 1971 Encyclopedia. Before then it was actually measured like that three times over from a drilled hole at the Oak Ridge National Laboratory in Tennessee and it was 1963 when they reported it as 0.73±0.04/μcal/cm-2 sec. That is 0.0305 ± 0.0017 W/m2. Now more recently most any unauthorized person may notice that the ice on top of Lake Vostok would have to have a very high thermal conductivity (for ice) to be conducting heat at the estimated planetary average of 0.06 watts per meter2 (1971 Encyclopedia) or 0.087 W ⋅ m2 (this article) through any temperature gradient that could be reconciled with the Wiki articles on Lake Vostok and Vostok Station where we find that the ice is about three and a half or four kilometers thick and the temperatures on the top where the station is have been getting around from about -31.9° C to about -68° C and the heat does not seem to be up to standard at that location either. The more recent estimates would more nearly fit a 1980 study of about 500 American wells showing most typical values of less than 30°C/km and also commonplace values substantially higher than that throughout much of the country [Kron and Heiken 1980]. One extreme location in Oregon was found with a gradient as high as 145°C/km, ± 20%, some other very high values were found in various places both in Oregon and Idaho [the map with much extrapolation between the dots was published by Andrea Kron and Grant Heiken of the U of CA Los Alamos Scientific Laboratory in 1980 and right now it is on line for free from the digital library of the University of North Texas], some geothermal power levels could be extrapolated, and for short term purposes and for power plants a continental power level of whatever hundredths of a watt per square meter would seem to be entirely incidental since there is hot rock down in there. Some large part of its accumulated thermal energy came from the rock itself, which has power levels of about 3.22 ⋅ 10-13 Watts/gram (whole continental), or about 6.7 ⋅ 10-13 W/gm (upper continental), but the much smaller amount of radioactivity in the floors of the oceans would be fine pickings by comparison (Peridotite, 3.35 ⋅ 10-15, Dunite, 1.25 ⋅ 10-16, Eclogite, 4.6 ⋅ 10-14 W/gm) and the geothermal power of oceanic regions and the migration of continents could not have come from that cause [Taylor and McLennan(1985) in Robertson p. 97]. A variation in surface temperature induced by climate changes and the Milankovitch cycle can penetrate below the Earth's surface and produce an oscillation in the geothermal gradient with periods varying from daily to tens of thousands of years and an amplitude which decreases with depth and having a scale depth of several kilometers. Melt water from the polar ice caps flowing along ocean bottoms tends to maintain a constant geothermal gradient throughout the Earth's surface. If the rate of temperature increase with depth observed in shallow boreholes were to persist at greater depths, temperatures deep within the Earth would soon reach the point where rocks would melt. We know, however, that the Earth's mantle is solid because of the transmission of S-waves. The temperature gradient dramatically decreases with depth for two reasons. First, the mechanism of thermal transport changes from conduction, as within the rigid tectonic plates, to convection, in the portion of Earth's mantle that convects. Despite its solidity, most of the Earth's mantle behaves over long time-scales as a fluid, and heat is transported by advection, or material transport. Second, radioactive heat production is concentrated within the crust of the Earth, and particularly within the upper part of the crust, as concentrations of uranium, thorium, and potassium are highest there: these three elements are the main producers of radioactive heat within the Earth. Thus, the geothermal gradient within the bulk of Earth's mantle is of the order of 0.5 kelvin per kilometer, and is determined by the adiabatic gradient associated with mantle material (peridotite in the upper mantle). TauTona Mine The world's deepest mining operation at 3.9 km (2.4 mi), where the rock face temperature reaches 60 °C (140 °F). ^ a b c Fridleifsson,, Ingvar B.; Bertani, Ruggero; Huenges, Ernst; Lund, John W.; Ragnarsson, Arni; Rybach, Ladislaus (2008-02-11). O. Hohmeyer and T. Trittin (ed.). "The possible role and contribution of geothermal energy to the mitigation of climate change" (pdf). Luebeck, Germany: 59–80. Retrieved 2013-11-03. ^ Sanders, Robert (2003-12-10). "Radioactive potassium may be major heat source in Earth's core". UC Berkeley News. Retrieved 2007-02-28. ^ Alfè, D.; Gillan, M. J.; Vocadlo, L.; Brodholt, J.; Price, G. D. (2002). "The ab initio simulation of the Earth's core" (PDF). Philosophical Transactions of the Royal Society. 360 (1795): 1227–44. Bibcode:2002RSPTA.360.1227A. doi:10.1098/rsta.2002.0992. Retrieved 2007-02-28. ^ a b Turcotte, DL; Schubert, G (2002). "4". Geodynamics (2nd ed.). Cambridge, England, UK: Cambridge University Press. pp. 136–7. ISBN 978-0-521-66624-4. ^ Vlaar, N; Vankeken, P; Vandenberg, A (1994). "Cooling of the earth in the Archaean: Consequences of pressure-release melting in a hotter mantle". Earth and Planetary Science Letters. 121 (1–2): 1. Bibcode:1994E&PSL.121....1V. doi:10.1016/0012-821X(94)90028-0. ^ Alfe, D.; M. J. Gillan; G. D. Price (2003-02-01). "Thermodynamics from first principles: temperature and composition of the Earth's core" (PDF). Mineralogical Magazine. 67 (1): 113–123. Bibcode:2003MinM...67..113A. doi:10.1180/0026461026610089. Archived from the original (PDF) on 2007-03-16. Retrieved 2007-03-01. ^ Steinle-Neumann, Gerd; Lars Stixrude; Ronald Cohen (2001-09-05). "New Understanding of Earth's Inner Core". Carnegie Institution of Washington. Archived from the original on 2006-12-14. Retrieved 2007-03-01. ^ Anuta, Joe (2006-03-30). "Probing Question: What heats the earth's core?". physorg.com. Retrieved 2007-09-19. ^ Johnston, Hamish (19 July 2011). "Radioactive decay accounts for half of Earth's heat". PhysicsWorld.com. Institute of Physics. Retrieved 18 June 2013. ^ a b c d William, G. E. (2010). Geothermal Energy: Renewable Energy and the Environment (pp. 1-176). Boca Raton, FL: CRC Press. ^ Wengenmayr, R., & Buhrke, T. (Eds.). (2008). Renewable Energy: Sustainable Energy Concepts for the future (pp. 54-60). Weinheim, Germany: WILEY-VCH Verlag GmbH & Co. KGaA. ^ Turcotte, D. L.; Schubert, G. (2002). "4". Geodynamics (2nd ed.). Cambridge, England, UK: Cambridge University Press. p. 137. ISBN 978-0-521-66624-4. ^ "Climate and Earth's Energy Budget". NASA. ^ Sclater, John G; Parsons, Barry; Jaupart, Claude (1981). "Oceans and Continents: Similarities and Differences in the Mechanisms of Heat Loss". Journal of Geophysical Research. 86 (B12): 11535. Bibcode:1981JGR....8611535S. doi:10.1029/JB086iB12p11535. ^ Rybach, Ladislaus (September 2007). "Geothermal Sustainability" (PDF). Geo-Heat Centre Quarterly Bulletin. 28 (3). Klamath Falls, Oregon: Oregon Institute of Technology. pp. 2–7. ISSN 0276-1084. Retrieved 2018-03-07. ^ K. E. Bullen (University of Sydney) in D. R. Bates The Earth and Its Atmosphere (1957) New York: Basic Books, page 46. ^ Basalt in List of Thermal conductivities here in Wikipedia. ^ Mitton, Simon, Editor-in Chief, Cambridge Encyclopædia of Astronomy (1977) New York: Crown Publishers Inc. 1978, page 174. ^ Diment, W.H., and Robertson, E.C., Temperature, thermal conductivity, and heat flow in a drilled hole near Oak Ridge, Tennessee Journal of Geophysical Research 68 (17), September 1, 1963 pages 5035 — 5047 and at least the abstract is free at https://agupubs.onlinelibrary.wiley.com/doi/10.1029/JZ068i017p05035 retrieved January 27, 2019 at 8:30AM EST. ^ Wikipedia, Lake Vostok, Vostok Station and Ice in Analytical List of Thermal Conductivities in List of Thermal Conductivities. ^ https://digital.library.unt.edu/ark:/67531/metadc100962/m1/2/zoom/?resolution=6&lat=4267.312494870114&lon=11206.080463525464 retrieved February 8, 2019 at 2:19 AM EST. ^ Robertson, Eugene C., Thermal Properties of Rocks, , United States Department of the Interior Geological Survey, Open-File Report 88-441, 1988 at https://pubs.usgs.gov/of/1988/0441/report.pdf Retrieved January 24, 2019 at 12:08 AM EST. ^ Turcotte, D. L.; Schubert, G. (2002). "4". Geodynamics (2nd ed.). Cambridge, England, UK: Cambridge University Press. p. 187. ISBN 978-0-521-66624-4. "Geothermal Resources". DOE/EIA-0603(95) Background Information and 1990 Baseline Data Initially Published in the Renewable Energy Annual 1995. Retrieved May 4, 2005.